Biomedics 1 Day Toric Lenses have now been renamed as the Biomedics 1 Day Extra Toric. 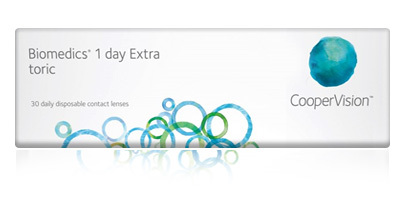 Coopervision have only altered the name and packaging of the brand. 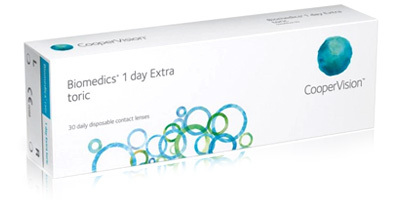 You do not need a new prescription to purchase the Biomedics 1 Day Extra Toric. Fitting Fitting generally represents the Base Curve and Diameter of the lens in mm.Typical values range from 8.00 to 10.00 for Base curve and 13.00 to 14.5 for Diameter Power Often called 'sphere' or 'strength. Measured in diopters and always preceded by - (minus) or + (plus). Negative (-) powers are prescribed to help correct short sighted conditions. Positive (+) powers help to correct a long sighted condition Cylinder A Cylinder value on your prescription is normally used when you have Astigmastism, a condition where the eye is not spherical thus light reflacts into the eye in a different way. Cylinder can be preceded by either - (minus) to correct short-sighted astigmatism or + (plus) to correct long-sighted astigmatism Axis Prescriptions with a "Cylinder" figure will also have an "Axis" measurement. Axis indicates in degrees exactly where on the eye the astigmatism is located. It is usually a figure between 0 and 180° and reflects the orientation needed in the Cylinder of the lens to correct your astigmatism. 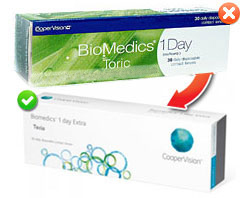 The Biomedics 1 Day Toric contact lenses from CooperVision are specially designed for stable and comfortable vision. These lenses are among the best available in the market today. The lens provides excellent comfort and clear vision to the wearer. Biomedics 1 Day Toric are disposable dailies. These lenses are designed to correct astigmatism. The result is that of sharp and clear vision. The special material used in The Biomedics 1 Day Toric contact lenses is specially designed so that you experience a smooth surface every time you blink. Another advantage of lens is that it benefits people who are very sensitive to dust, pollen and allergies. 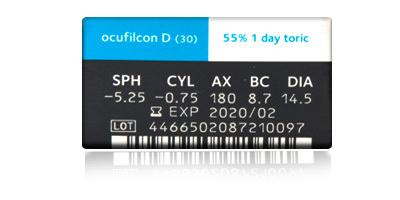 Biomedics 1 Day Toric also give a good option to people who tend to switch between spectacles and contact lenses. These lenses are also convenient for sportspersons. As these are disposable dailies, the hassle of daily storage and cleaning of the lenses is avoided. It is also a healthier option as the lenses are replaced on a daily basis and therefore do not require additional solutions. By using the Biomedics 1 Day Toric contact lenses by CooperVision, one can be assured of healthy eyes with a clear and sharp vision all day long.